Should America Abandon Its Constitution? That must seem like a silly question. 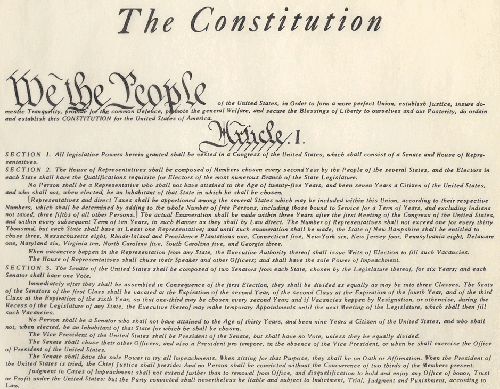 Isn’t the Constitution the bedrock of our society, our political system, and our legal system? And didn’t the Republicans seize power in the House of Representatives to defend the Constitution against Obama? I’m ambivalent about people who claim to be “defenders of the Constitution.” First, most of them aren’t. And second, though I’ve spent many years arguing that America should return to following its Constitution, I’m no longer sure that it’s a good idea. Americans tend to forget — if they ever knew — that the U.S. Constitution set up a system of enumerated powers for America’s federal government and un-enumerated rights for the states and the people. Are clearly necessary to carry out the Constitutionally-authorized activities. In other words, the legitimate powers of the federal government are “enumerated” (listed) by the Constitution. However, the rights of the states and the people are not limited to those enumerated in the Constitution. The states and the people have not only specific rights listed in the Constitution, but also have all their historic rights from tradition, the British common law, and settled practice. The general welfare clause, which states that the Constitution is intended “to promote the general welfare,” is often used as a catch-all justification for federal government activities. However, the general welfare clause states a goal of the Constitution, not a power of the federal government. It doesn’t authorize anything. In 1787, the American population was divided about whether or not to adopt the new Constitution as a replacement for the Articles of Confederation, which had governed the United States up to that point. Supporters of the new Constitution wrote a series of essays called The Federalist Papers in which they answered objections to the Constitution. The authors of The Federalist Papers opposed adopting “the Bill of Rights,” that is, the first 10 amendments to the Constitution which list specific rights of the states and the people. The main reason they opposed a bill of rights was that the federal government was already forbidden to do anything not listed in the Constitution. I go further and affirm that bills of rights … are not only unnecessary in the proposed Constitution, but would even be dangerous. They would contain various exceptions to powers which are not granted; and on this very account, would afford a colorable pretext to claim more than were granted. For why declare that things shall not be done which there is no power to do? Hamilton’s fears were well-founded. In the 20th and 21st centuries, the fact that the Constitution lists specific rights has enabled supporters of oppressive government (who falsely call themselves “conservatives”) to claim that Americans have only the rights listed in the Constitution. Moreover, when Thomas Jefferson wrote, Congress was seen as the one and only law-making body in the federal government. Hence, when he talks about limits on the powers of Congress or the United States, he means limits on the powers of the federal government. No one among the founders even imagined that the executive branch and its agencies would be laws unto themselves. That, too, is a power not listed in the Constitution — and thus is Constitutionally forbidden. In essence, contemporary political theory has turned the U.S. Constitution upside-down. Originally, the federal government was forbidden to do anything not specifically permitted by the Constitution, while the states and people were free to do anything not specifically forbidden by the Constitution. Now, the U.S. federal government claims that it is free to do anything not specifically forbidden by the Constitution, while the states and the people are forbidden to do anything not specifically permitted by the Constitution. But there’s another side of the argument. In the 21st century, should the United States follow a Constitution that was designed for an 18th-century society? De Montesquieu (in The Spirit of the Laws, which inspired the American founders) said that laws should match the people for whom they were created. And though it’s doubtful that the legal sewage of the Bush-Cheney nightmare and Obama freak show would match any population above the level of particularly stupid and thuggish monkeys, it’s also true that the U.S. Constitution no longer matches the American population. At the time the Constitution was written, the American economy was decentralized and largely agrarian. Americans were almost exclusively Anglo-European and were highly self-reliant. They were literate and informed: instead of being an assignment for college students, The Federalist Papers were printed in newspapers and debated in taverns. Americans considered themselves first and foremost to be citizens of their states, not of a vast nation-state. As recently as 1965, the American population was 88 percent white, 11 percent black, one percent “other,” and almost everyone spoke English. Those things are no longer true. We now live in a centralized, urban, and technological society of multiple races, nationalities, languages, and cultures that is held together only by the armed might of the federal government and the economic power of giant corporations. Blacks hate whites, women hate men, gays hate straights, Muslims hate the West, and our children are taught to hate themselves. The United States is now quite similar to the Soviet Union just before it fell apart, including the wars in Iraq and Afghanistan, military bases and covert wars around the world, and the oppressive domestic internal-security state. If the United States followed its Constitution, the country would shatter into at least a dozen pieces. That might be a blessing in the long run, but in the short run it would be very, very difficult for many people. That’s why Republicans like Senator Mitch McConnell (R-KY) and House Speaker John Boehner (R-OH) aren’t serious about following the Constitution, no matter how much they talk about it to deceive their grassroots supporters. They work for Wall Street, giant corporations, and the super-rich, who would suffer financially if the United States collapsed. They won’t let that happen if they can avoid it. Democrats aren’t serious about following the Constitution, either. Social programs that benefit their client groups are all un-Constitutional. So hardly anyone wants to follow the Constitution, but everyone wants to pay it lip service. It exists only as an empty symbol, to which people vow undying loyalty and then completely ignore. Isn’t it about time we ended the pretense? Copyright 2011 by N.S. Palmer. May be reproduced as long as byline, copyright notice, and URL (http://www.ashesblog.com) are included. I think there’s something to be said for a constitution as an explicit list of government powers. But of course, if it’s not a living document (as they say), it will quickly ossify and fail. There has to be some ambiguity in what a government’s actually able to do. Where in a document written in 1787 will you find an explicit authorization to regulate air travel, or undertake space exploration? I think most people would agree that the fact that the US Constitution doesn’t, and couldn’t, have included such powers doesn’t mean to say it’s a good idea that governments in the US leave these matters unregulated and unaddressed. The problem is, having identified that the powers of an evolving government require interpretive wiggle-room, how much room is to be afforded? I think that’s where the value of a bill of rights comes to the fore. Such explicit limitations are crucial; if they’re observed, they are the limits of that wiggle-room. Consider that as free a country as the United Kingdom, which has no such constitutional limitation, routinely suspended a variety of civil rights right up to the 1990s, particularly in Northern Ireland. Arguably, rather than ameliorating the situation, such flagrant disregard for rights exacerbating things and gave more justification to the very people it sought to make impotent. Frankly, I think having a constitution without a bill of rights is like buying toaster without a warrantee. Is it enough to hope it won’t burn your house down? The US Constitution has had a bill of rights virtually since its inception. It took a long time to work out what a lot of it meant, but it was there, and so it was worked out. In Canada, there was for a long time what was called “the implied bill of rights”, which basically meant the government wouldn’t casually trample your vague, unstated, but broadly-recognized as-inherited-from-Mother-England rights. Obviously such matters didn’t wind up before the courts very often, and even when they did, the courts generally upheld the rights of legislatures to pass whatever laws they deemed necessary. In 1960, PM Diefenbaker at least got us the Canadian Bill of Rights. But this was simply an act of Parliament that self-declared itself as supersessionary to all other acts… it was binding only on federal government, and only when an act wasn’t written specifically excluding itself. It remained, and remains, just another law that Parliament could, if it wanted, amend or even repeal on a whim. It wasn’t until 1982 that Canada actually got a constitutional schedule of rights. Till then, judicial review was rare in Canada. A lot of people, then and now, lamented the Charter of Rights and Freedoms as the “Americanization” of our constitution. But I wouldn’t be without it and neither would most Canadians, the polls all indicate. No human system is ever prefect. They have to be adaptable in order to remain workable over time, and I think the US Constitution has actually done surprisingly well. Maybe it could use an overhaul (I’d really like to see the Second Amendment repealed or at least clarified, for instance); it might cause more trouble than it solves to do so, though. Ditto scrapping it and starting over. I think the US has to simply keep doing what it has been doing… living with a powdered wig and knee-britches constitution that’s had a cowboy hat, bow tie, and platform shoes added onto it as time goes by. These are clothes the political system has to live within, making a nip here and a tuck there. And hey, there are worse fits and way, way uglier costumes out there, we all know that. Keeping testing the limits, keep letting it out where it needs room and taking it in where it doesn’t. But don’t throw it away. If you do that, you leave the emperor naked, and his terrible ambition as well. Thanks for another thought-provoking comment. Possibly, but both Tea Partiers and Republican politicians avow that they want strict adherence to the Constitution. The most likely explanation is that they don’t know what it says, or in the case of the politicians, they don’t care what it says. Many informed people believe that, but here I must disagree about the protective value of bills of rights. Politicians and other government officials, as well as the super-rich and their corporate top management, will always try to push the envelope. That’s not unique to them: it’s human nature. Unless a determined and powerful group of people pushes back, they will progressively redefine laws, Constitutional provisions, and bills of rights in their own favor. In the last 100 years or so, we have seen an inexorable dumbing-down of the electorate. That has occurred partly by lowered educational standards and partly by extension of the franchise to groups that are easier to manipulate and less informed about civic affairs. Also, a democratic system cannot work well in a large, multicultural empire: individuals have almost no influence on what happens in politics. As a result, the powers that be have had almost free rein to change the rules in their favor. The vast and widening gap between the super-rich, the merely rich, and the rest of society testifies to that, as does the retreat of worker protection and consumer safety laws. The bottom line is that bills of rights only work when they’re not needed very much. In other circumstances, they’re redefined out of existence. On one issue, I agree with something you implied but didn’t explicitly state. The fact that the Constitution is an “empty symbol” doesn’t make it valueless. It provides a focus for civic loyalty and cohesion even if people disagree about what it says, just like the Bible. Americans can all agree that they are loyal to the Constitution, however they define it, just as British subjects are loyal to the Crown. Symbols themselves have power.